Lisp was invented by John McCarthy in 1958 at the Massachusetts Institute of Technology (MIT). After Fortran, the second oldest high level programming language is LISP. LISP has several dialects have existed since over its history and this has changed a great deal since its early days. Now-a-days the most widely known general purpose Lisp dialects are Common Lisp and Scheme. 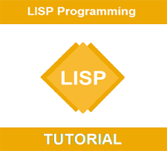 This has been prepared to help the beginners to understand the basic to advanced concepts of LISP Programming Language. Assuming that you are already aware about what is a computer program and what is a computer programming language various types of examples are explained in this tutorial.